My blog-posting has been very slow lately, and I apologize. So here's a short review for a very sweet anime. I needed my shoujo fix because my crave for that genre is real. If you don't know me, shoujo is probably my favourite genre of anime, it's so formulaic and repetitive from anime to anime that you basically know what to expect when you watch a shoujo. That's why I like shoujo a lot- you know what to expect so you tend to be less disappointed. So going into watching Akagami no Shirayuki-hime, I knew what I was getting myself into, and needless to say my shoujo crave was very well satisfied. A commoner/herbalist becomes one with a prince, sounds like a fairy tale eh? Akagami no Shirayuki-him follows the story of a herbalist name Shirayuki as she unexpectedly finds herself ending up in the kingdom of Clarines with the help of Prince Zen. The story kind of feels like a Disney fairytale, there's really no other way I can think of describing the story. I personally think that Akagami no Shirayuki-hime has that fairy tail cliche aspect to it- and there's no shame in that, just don't expect anything more from a this anime. In terms of the characters, there's nothing really proprietary about either Prince Zen or Shirayuki. Shirayuki is more of a lady trying to establish herself and prove her worth to the Clarines kingdom by working towards being a court herbalist. Whereas Zen is more laissez fare and...eh. So I guess what spices up the anime is watching Shirayuki getting herself in and out of these so-so conflicts and watching her journey attempting to prove herself against the people in the Kingdom who doubt her. Now a days I barely comment on animation since it seems like these days people don't bat an eyelash caring about it since everything is quite up to date these days. Though I will say Bones did a great job bringing Akagami no Shirayuki-hime to life. Everything from the character designs to the stills to the amazing colouring were absolutely beautiful and mesmerizing at times. I mean look how beautiful Shirayuki and Zen are! Maybe that's why I was in awe of this anime. That's it for this review. Sorry if the review was kind of bland, it's difficult to review shoujo I find; unless it's an out of this world type of shoujo like Nana or Kimi ni Todoke. So Akagami no Shirayuki-hime kind of falls in that category of "typical shoujo." If you're a shoujo fanatic like me and need to watch another shoujo go for Akagami no Shirayuki-hime. If you've seen so many shoujo to the point where you're numb to it, don't bother with this. Please leave a comment down below on your thoughts about Akagami no Shirayuki-hime! Right? 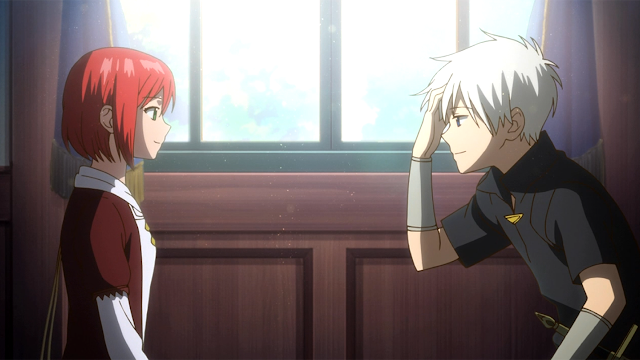 I prefer school/ practical real life shoujo anime too, but Akagami no Shirayuki-hime was nice too!